This article describes how to connect to an ECS instance on a mobile device. Depending on the operating system of your instance, select the required method as follows. 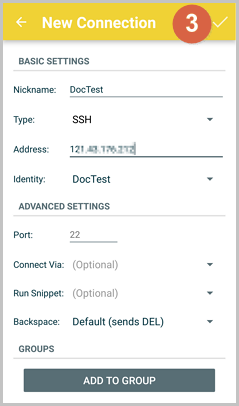 Connect to a Linux instance: This example uses SSH Control Lite to describe how to connect to a Linux instance on an iOS device, and JuiceSSH to describe how to connect to a Linux instance on an Android device. 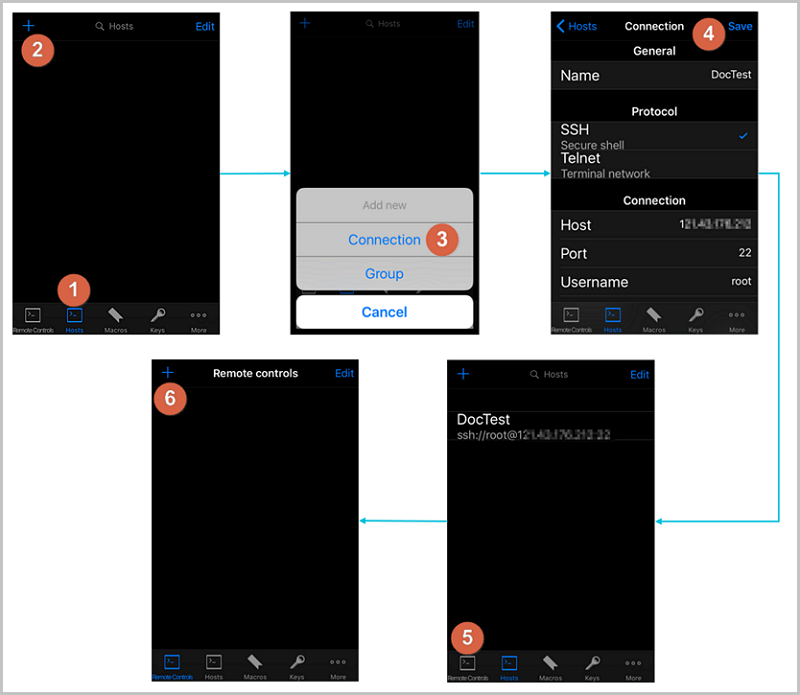 Connect to Windows instances: This example uses Microsoft Remote Desktop to describe how to connect to a Windows instance on an iOS or Android device. The instance is Running . The instance has a public IP address and is accessible from the Internet. You have set the logon password for the instance. If the password is lost, you can reset the instance password. For an iOS device, install SSH Control Lite. For an Android device, install JuiceSSH. For iOS devices, see use SSH Control Lite to connect to a Linux instance. In this example, a user name and password are used for authentication. 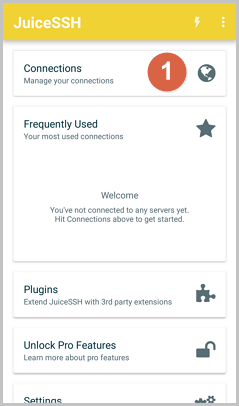 For Android devices, see use JuiceSSH to connect to a Linux instance. In this example, a user name and password are used for authentication. Start SSH Control Lite, and tap Hosts. Tap the + icon in the upper left corner of the Hosts page. 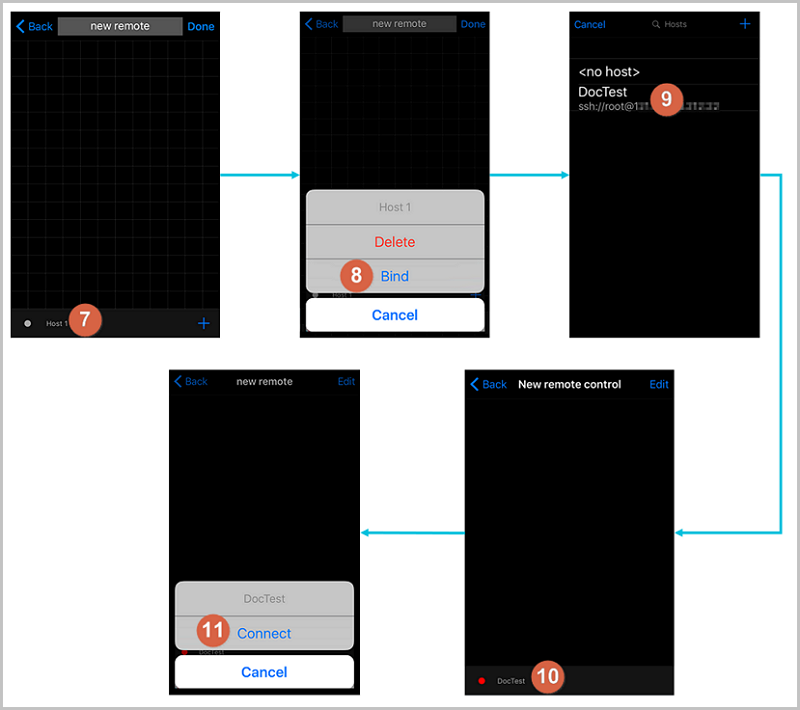 In the action sheet, tap Connection. Name: Specify the Host name. 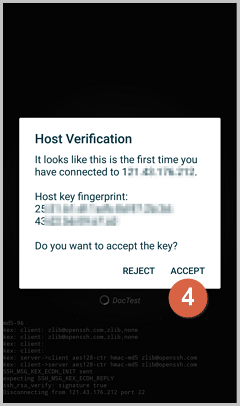 DocTest is used in this example. .
Protocol: Use the default value SSH. Host: Type the public IP address of the Linux instance to connect to. Port: Type the port number for SSH protocol. 22 is used in this example. Username: Type root for the user name. Password: Type the logon password of the instance. In the tool bar, tap Remote Controls. 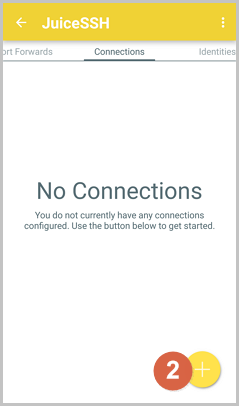 On the Remote Controls page, tap the + icon in the upper left corner to create a remote connection session. New remote is used in this example. The following figure shows Steps 1 through 6. On the New remote page, tap Host1. In the action sheet, tap Bind. Select the new Linux instance. In this example, select DocTest. 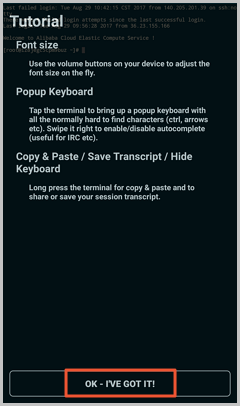 On the New remote page, tap Done to switch it to the Edit mode, and then tap DocTest. In the action sheet, tap Connect. The following figure shows Steps 7 through 11. In the action sheet, select Yes, Once or Yes, Permanently. Once the connection is successful, the indicator in front of DocTest turns green. On the New remote page, tap DocTest. In the action sheet, tap Console to open Linux instance console. Start JuiceSSH, and tap Connections. Under the Connections tab, tap the + icon. Nickname: Specify the name of the connection session. DocTest is used in this example. Type: Use the default value SSH. Address: Type the public IP address of the Linux instance to connect to. Tap Identity, and tap New in the drop-down list. Nickname: Optional.DocTest is used in this example. Password: Tap SET(OPTIONAL), and type the logon password of the instance. Port: Type the port number for SSH protocol. In this example, 22 is used. Confirm the message, and tap ACCEPT. (Optional) For a first-time connection, the app will show a prompt of helpful tips. Tap OK - I’VE GOT IT!. If you are successfully connected to the Linux instance, the following screen is displayed. In this section, Microsoft Remote Desktop is used as an example to describe how to use an app to connect to a Windows instance on a mobile device. You have set the logon password for the instance. If the password is lost, you must reset the instance password. You have downloaded and installed Microsoft Remote Desktop. For iOS devices, download the app from iTunes. For Android devices, download the app from Google Play. Start RD Client. In the navigation bar, tap the + icon. On the Add New page, select Desktop. PC Name: Type the public IP address of the Windows instance to connect to. User Account: Type the account name administrator and the logon password of the Windows instance. On the Remote Desktop page, tap the icon of a Windows instance. On the confirmation page, confirm the message and tap Accept. 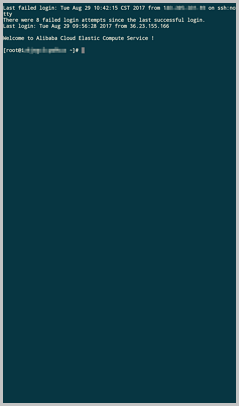 If you are successfully connected to the Windows instance, the following screen is displayed.